Do-it-yourself PC upgrade projects : 24 cool things you didn't know you could do! 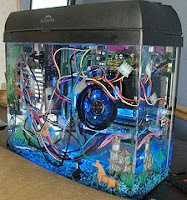 hey, that's my crazy fish tank computer! Thanks for the compliment. I basically just followed the guides at http://www.pugetsystems.com/submerged.php with some old Gateway hardware.